Single-ply membranes can be generally categorized into two groups: Thermosets and Thermoplastics. Thermoset membranes are compounded from synthetic rubber polymers, and the most commonly used polymers are EPDM, CSPE and Neoprene. 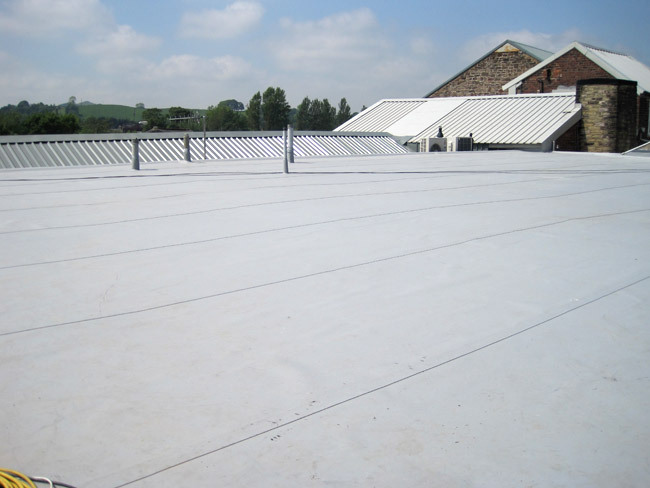 Thermosets membranes are ideal for large roof areas, due to the fact that their manufacturing size is ideal to reduce or minimize seams. The majority of EPDM thermosest black membranes have carbon black as an additional component, which increases the UV protection; and in the case of white membranes, the manufacturer adds titanium dioxide, increasing the reflection property against UV rays. Seams on thermoplastic single-ply membranes can be hot-air welded together to form cohesive laps. When thermoplastic membranes cool, they return to their original material type. Two of the most commonly used thermoplastic single-ply membranes are PVC and TPO, both of them plastic-based materials. Thermoplastic membranes are usually manufactured to include a reinforcement layer, normally polyester or fiber glass that provides additional strength and stability.